Googlers have buried Molyneux's Cube under a heaping mound of Mars. 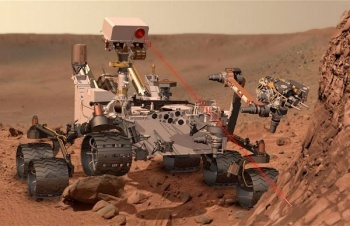 When NASA's crazy laser-wielding space robot Michael-Bayed onto Mars a few weeks back, people got pretty excited. And it's hard to blame them; stories of the metal astronaut's voyage were the stuff of legend before the thing even launched, what with it's hyper-precise space crane landing, and supersonic parachute. It seems the only person perhaps not quite as thrilled as the rest of us was poor Peter Molyneux, whose newest game just so happens to share a name with Earth's (and Mars') newest hero: Curiosity. Now, that's not entirely fair to Molyneux, who I'm sure loves Curiosity the Robot just as much as the next guy, but the fact remains that with so much hubbub surrounding that soulless little $2.5 billion photographer, Google search results for his game just can't compete. So without Google on his side, Molyneux has decided to abandon calling the game now formerly known as Curiosity Curiosity at all. "The name change is prompted by the need to have something simple to search for in Google," Molyneux explained. "This worked well for Curiosity but since NASA: Curiosity is now obviously generating a lot of interest we need to change the name." For those unfamiliar, Molyneux's game involved a large number players hacking away at the outside of a cube, hoping to deliver the last blow, purportedly the only blow that will reveal whatever it is that Molyneux is hiding in there. In that sense, Curiosity was an extremely apt, if not a nearly perfect name for the experience. In the wake of NASA's secret conspiracy to keep us from seeing what's in the Cube (it's proof of the fake 1969 moon landing, I'm tellin' ya! ), Molyneux has taken to Twitter to find a new moniker for his newly-founded company, 22 Cans', flagship title. If you want to contribute your own great idea, feel free to Tweet your heart out to [at]22cans.